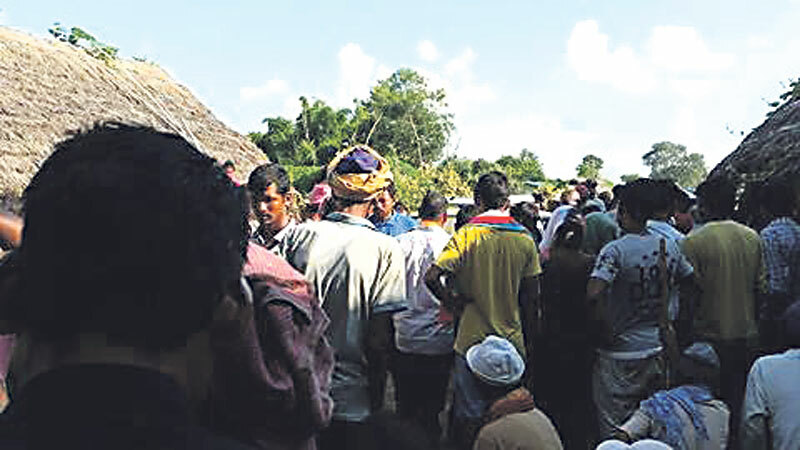 BARDIYA, Sept 18: A deep scary silence has been prevailing in two Tharu villages of Suryapatuwa VDC since Thursday after a child and an elderly were crushed to death by wild elephant. 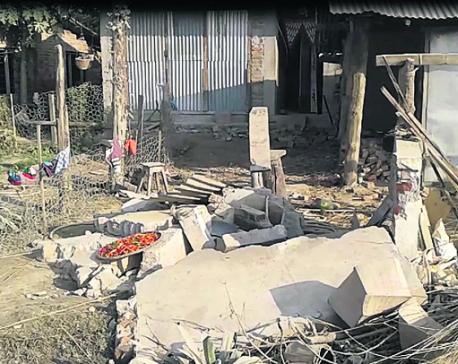 The pain and the terror has gripped the villages and the surrounding villages so much so that none of the households in the villages have cooked proper meals fearing elephant attack on the village. They have stopped tending crops in their farms; housewives have barely left their toddlers and children sight. With no one coming to the fore to ensure their safety, the VDC remains thunderstruck. Wild animal attacks are not a new thing for these communities. But Thursday’s incident has terrified them. At 2 pm on the day a 15 year-old school boy, Yuvaraj Tharu, was attacked by an elephant. Five hours later, a forest guard Purai Tharu, 72, met the same fate. Both were crushed by elephant’s feet and succumbed to the attack hours later. Purai was a guard deputed to protect crops in the farm from elephants. Yuvaraj was the only son of the family. On the fateful day, he was coming back from Tribhuvan Higher Secondary School located near his house. At Paththarbojhi of Suryapatuwa village he was attacked by the elephant. 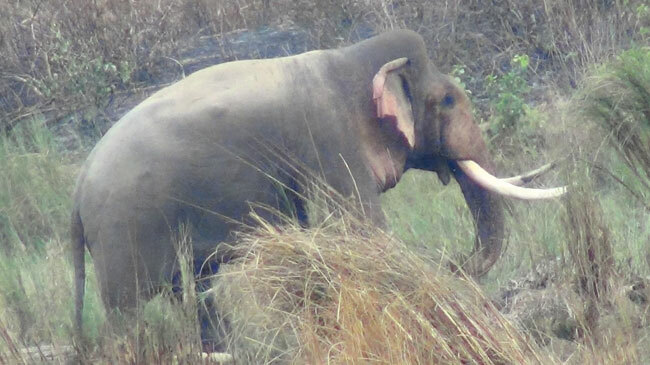 Purai was roaming around in a field when he encountered an elephant and was subsequently crushed by it. The two villages are called Tharu village due to their dominance though people of other communities live there, too. Expressing solidarity with the family of the deceased and also due to terror that reigns, the villagers have not lit light at their home. “We have no words to express our woes. It is difficult to save our lives from elephants,” said Shyam Chaudhari with tearful eyes. He had just returned home after offering last prayers for the two deceased. The last rites of Yuvaraj and Purai were performed in Patharboji ghat on Friday at 4 pm. The dead bodies were taken to the ghat after post mortem in Kohalpur Teaching Hospital. Shyam said that Yuvaraj was taken to hospital for treatment following the attack. But the injuries were too serious and he was declared dead by doctors when upon reaching the hospital. Purai was killed on the spot. Before the deaths, the villagers would remain awake through the night guard their farms from elephants by making noise hitting on utensils. They would campfire whole night to protect their farms as the elephant did not confront the villagers. But with the death, it has changed. Now the villagers are scared of confronting the elephants with traditional means of scaring them away. Ramesh Thapa, chief of Bardiya National Park, said that the issue is very sensitive. The park’s report says that elephants destroy villagers’ crops and houses every year. “Our records show that elephant have destroyed hundred of houses and many hectares of crops through the years. This puts the villagers at great risk,” he said adding that elephant’s higher smelling abilities have been the major factor for them to trespass into human settlement. Thapa said that a team including elephant experts and Nepal Army soldiers has been deployed in the affected areas. He informed that the Thursday’s death came despite the team’s presence in the area. One of the reasons of growing terror of elephant is the existence and mismanagement of community forests, according to the locals. Community forests can hardly ensure security measures as national parks. Yet, they can draw tourists by wooing them about elephant sights. “But that is posing danger to the human settlement,” said a local of Suryapatuwa VDC. He added that the government should take necessary steps for the safety of the people as well as elephants.